The beginning of a journey is a time of daring mixed with naivety—all we need to do is risk beginning and events take over from there. The last stages of a journey feel more complicated. Realizing that the end is near, we want to make sense of it—learn from our mistakes, celebrate our successes, or grab a kernel of wisdom before life’s tides take us to the next place. Where do you get stuck? Beginnings or endings? What is your innate gift: the courage to take a leap into new territory or the drive to understand what has happened? Both of these qualities are needed at this time of great change. It may be difficult right now to know which gifts are most helpful or how to maintain a single point of view. Perhaps we are not being asked to know the answer to these questions; perhaps the best thing we could do is to act as best we can in alignment with personal values and leave the rest to mystery. This lunar cycle is ripe in contrasts—contrasts between dream and action, ending and beginning, forgetting and remembering. It seems entirely appropriate, given such extreme fluctuations, that we end up in the last week of this lunar cycle not really knowing where we are. Or at least, that’s what I am noticing for myself. Perhaps some of you are feeling this too. 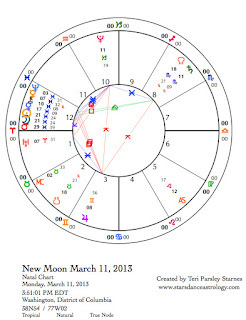 The New Moon on March 11,* invited us into the Pisces realm to both forget the past and open to the dream. Paradoxically, a time of forgetting is part of the process to opening to the dream of a new cycle of growth. What rises up for you when you release the past and take the leap into the unknown? What have these last three weeks been like? What emotions, events, and realizations did you harvest? Where does this leave you as you begin to let go of the entire lunar cycle to prepare for the next New Moon in Aries? We’ve been standing at a doorway. There is a threshold before us. Questions always arise at these moments. Will you choose to live into the life you are meant to live? Are you ready to move forward? Sunday March 31. Fiery natures may be provoked today if they can’t find a productive release of energy. This is not a day to take it easy; the rising energy of Spring asks us to be active. Women’s issues may be at the forefront (as they have been for a while) since Venus is square to Pluto and sextile to Jupiter today. The Pluto connection reveals toxic and unhealthy conditions. It is up to us to release and transform these patterns. The Jupiter connection makes these processes bigger, both the power to heal and the power to harm. Venus and the Sun are so close that later in the day, the Sun also squares Pluto. What is illuminated right now about toxic systems? An empowered Venus is an ally for beauty and love and the kind of wealth that sustains these things. What bold action will you take to support the life force? Monday, April 1. If we were able to face some demons yesterday and do something about it, today dawns with more optimism. The Moon is void-of-course for the whole day, so we don’t feel as motivated to finish things. This may be a good day for planning the next project that will take you to your growing edge. The Sun and Jupiter conspire to inspire our hopes. April 2—Last Quarter Moon: Evaluating. The Capricorn Moon supports a process of evaluating whether or not something serves our long-range goals. Perhaps like me, you’ve followed dreamy pathways to this moment and have a hard time evaluating their worth. Perhaps it is hard to even recall where those pathways have led you. Let go of the linear and ask yourself, “How do I know when something is right for me?” We have the ability to know ourselves deeply and to know when we know. What does it feel like in your body? Find an anchor to this knowing, it will come in handy all year. We may be called on to think fast and take powerful positions today in support of what is right for us. There is a sense that changes that have been building for a long time are now starting to manifest. We’ve been in training for a long time to step into our part of this story. Wednesday, April 3. Here’s another day when the Moon is void-of-course for most of day. Use this energy to get in touch your bottom line. This could be in the area of finances, relationships, or commitments. We all need foundations and boundaries around the arenas of life that are vital to our happiness. What are yours? Thursday, April 4. An interesting relationship between Pluto and Chiron has been going on since September of last year. These planets (yes, we know neither are a planet in astronomical terms) are concerned with depth experiences and deep healing. Today is the second of five exact sextile aspects between the two, ending in 2014. One manifestation of this transit is the desire to do something about the pain and suffering we see around us and in our own lives. Feeling compassion is not enough; we need to take action too. With the Moon is revolutionary Aquarius, we are called even more to act, to organize, or search for solutions. Friday, April 5. Welcome new insights. Someone is introducing you to a new way to think. Enjoy the shift in your own point of view. Perhaps you also are doing that same for someone else. This is a good day to appreciate diversity and community connections. April 6—Balsamic Moon: Surrendering. At the beginning of this lunar cycle we surrendered to an ocean of feelings. Today we dive back in for another time of surrender and release as the Moon wanes into its final phase of this cycle. For the next two days, welcome the water in you. Welcome the power of water to cleanse, dissolve, nourish, and connect us. We need these qualities. As the world speeds up, as we are asked to change, as we prepare to leap into another year, connect with the water within and around you. A spark of creativity and possibility awakens today within this watery awareness. Venus and Mars form an exact conjunction in Aries. The last time these planets were conjunct was in 2011. What makes this conjunction a little more special is that both Venus and Mars are hidden within the rays of the Sun. Shamanic astrologers overlay a mythic journey to the underworld upon planets who are temporarily hidden from sight. *** The classic lovers are united in the depths of transformation. If we choose it, we can allow this animating transformation to inform our relationship to action and our desires to pursue the most beautiful telling of our own stories. I feel like a cranky toddler who doesn’t want to wake up from her nap. I remember my kids going through this when they were little. If you are a parent, you probably know what I mean, those days when nothing makes them happy, not the staying in bed and not the getting up. Best word for it: cranky. This late Pisces season* that is now in the process of shifting over into Aries is just like that for me. This week, we are all going through the transition from napping to waking. How does it feel for you? For myself, noticing this crankiness, I invite mindfulness—a state of non-judgmental self-awareness. Then, I am able to ask myself, Why is this emotional state showing up? How do I make room for it and allow it to move me forward into Spring? How is this mood part of manifesting my intention this lunar cycle? The transition between one sign in the zodiac to the next takes a bit of an adjustment. The qualities of adjoining signs are quite different from each other. However, I’ve always felt that the transition between Pisces and Aries is one of the most difficult. Seasonally, we are moving from Winter to Spring, from an expanded awareness of the whole to an individuated awareness of the self. Part of me wants to stay in the collective sea and the other part wants to get on with my own journey. The first experience we have as newborns is leaving the womb where we were merged with our mothers to begin life as a distinct individual. That change is what we are dealing with right now. Our birthcharts are set for this moment. The moment of the transition between the womb and life is the pattern that impacts our whole lives. It’s kind of a big deal. Maybe that’s why I feel cranky. I don’t really want to bring all the consciousness that I can to this moment. I want to space out, forget, eat too much, sleep too much. It makes perfect sense to me. And so I notice. This week, Spring begins as the Sun enters Aries on March 20. The chart for that moment is like a birthchart for the collective. 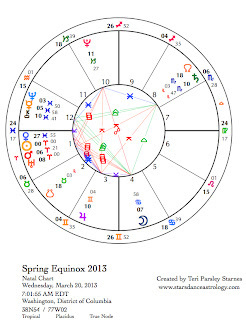 Astrologers call this type of chart an ingress chart and it can be used to forecast the coming year for a nation. So, if you are also feeling some pressure about the significance of the moment and not sure you really want to dive into it all, give yourself a break. I always tried to give my kids lots of room when they were cranky. I know transitions can be hard. Sunday, March 17. The planets in their journeys reflect states of being. One of the things that Mercury’s retrograde cycle reflects is the frustration of communication, commerce, thought, or travel not working out the way we want it to. There’s been a bug in the systems the last three weeks. That can make any of us cranky. Today, Mercury stations direct. We can look forward to more clarity, but probably not just yet. The Moon is in Mercury’s home sign and so we may think about things faster than we can actually accomplish them. If you are planning on being part of or around St. Patrick’s Day celebrations, take extra care to slow down, others may not be thinking clearly. Monday, March 18. Mercury stationed direct in Pisces yesterday. That planet has seeded something in our unconscious we may not understand until after April 6 when it reaches its retrograde degree. However, subtly, we may notice being called to wake up into the action of the impending Spring—just a little. There are no major aspects today, yet the energy of connection, conversation, and curiosity is strong. March 19—First Quarter Moon: Manifesting. “I open to the dream I will live by for the next year;” that is the intention I am investigating this lunar cycle. There are different kinds of dreams. The Pisces dream comes from the unconscious, isn’t easy to express in words, and may not ever be completely understood. This type of dream leads to an initiatory experience. To be led by this kind of dream is to say I will let my own soul, which I have no control over, be a guiding force in my life. I will be led by my own becoming without knowing what I will become. At this phase of the Moon we encounter challenges to intention, second thoughts, doubts, limitations in understanding, and blockages in flow. These challenges are necessary to the initiation. Today is the last day of Sun in Pisces for this year. With the Moon in another water sign, Cancer, honor the unconscious dream and the challenge of trusting in the wisdom of that force. Offer a home to your own becoming. March 20—Vernal Equinox. The transition is over; the birthday of the year is here. From here on out, life speeds up. 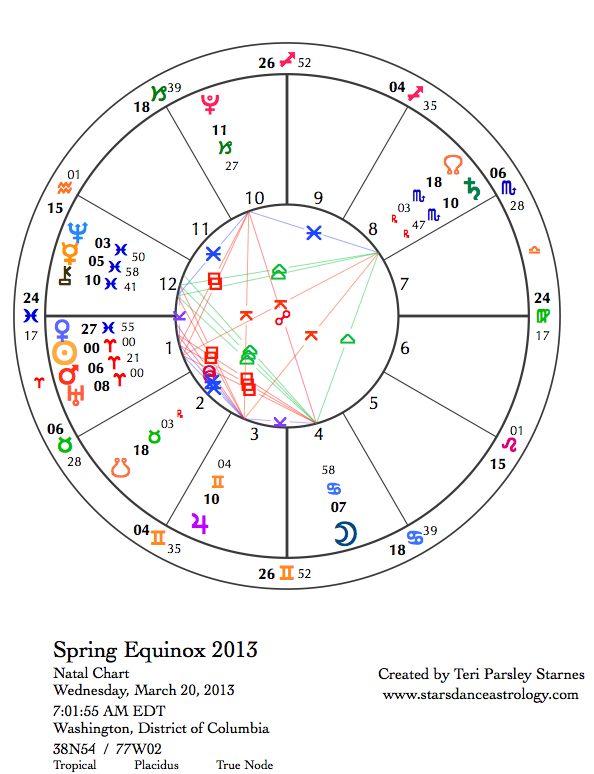 The chart for the Equinox shows Mars in Aries moving towards a conjunction with Uranus and a square to Pluto. 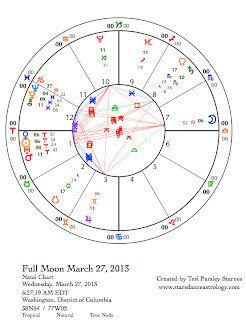 The Moon in Cancer is forming a square to Mars/Uranus and is opposing Pluto. These Cardinal signs provoke each other. Essential parts of life—like Selfhood, Home, and Mastery—are agitated by these planets. Things that have needed to change for a long time are suddenly on the front burner. Other planets have strong voices now too. Saturn in Scorpio is at the apex of a Yod that involves Jupiter in Gemini and Uranus. We search for simple solutions, but Saturn forces us to be accountable to things that usually are hidden. Check out assumptions. Don’t believe your first thoughts. What is really motivating the changes you are making? What is really motivating others? These desires go deeper than our first impressions. And because of this depth, real healing is possible. Another Yod, with Jupiter at the apex challenges our intentions to go slow and be thoughtful. In spite of the tension, volatility, and drama of this chart, there is a strong underlying component of water. We can empathize with others and come from a place of compassion. This may be our saving grace. Thursday, March 21. The day begins with a harmonious connection between Saturn and Chiron, offering hope that real healing is possible. We are encouraged to commit to healing both self and others. Any Scorpio style of healing is especially potent—those methods that are soulful, depth-oriented, and transformational. Venus joins the crowd of planets beginning to amass in Aries adding spark to our relationships. Maybe it is time to ask ourselves what we really want from our friendships and partnerships. Allow others in your life a little more freedom. Breathing space can be good. Friday, March 22. The Moon being in a fire sign today just may save us from the strong impulsivity that this day holds. The Leo Moon encourages us to be playful, creative, and spontaneous. Just the thing for when Mars comes into an exact conjunction with Uranus today at 8 degrees of Aries. These two planets can ignite rapid change, especially in a fire sign like Aries. The key ideas for Uranus: revolution, change, authenticity, radicalization, awakening, and innovation will be in evidence. Honor these parts of yourself. We are officially in the season of awakening. In the evening, as the Moon squares Saturn we have the opportunity to take a breath and reflect on how to use this energy responsibly over the long haul. 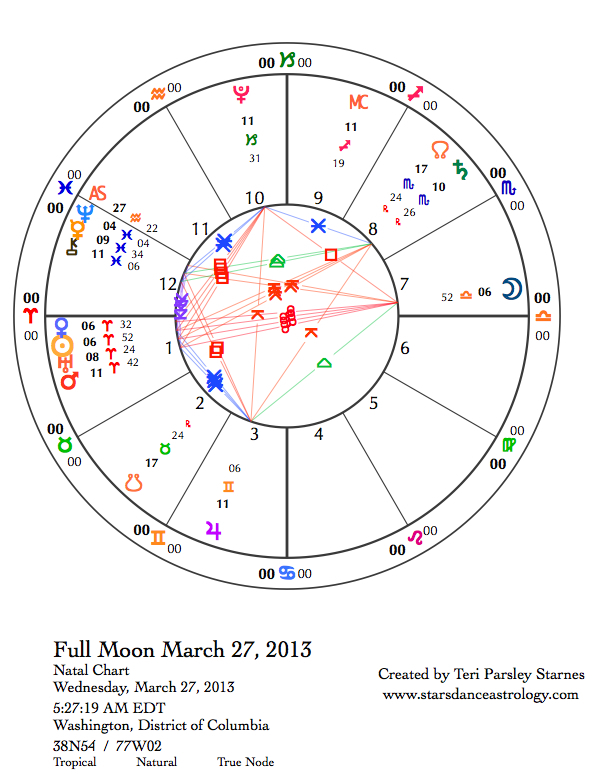 March 23—Gibbous Moon: Perfecting. The last few days have been energetic, exciting, and possibly even alarming in some way. There are gifts in all of these experiences that can feed our intentions. The gibbous phase of the Moon brings new challenges because we are still reaching for something, trying our hardest to manifest something new. Tension builds between yearning and reality. We feel this tension today from the quincunx aspect between Jupiter and Saturn. If Jupiter is wild hope then Saturn is grim reality. Both of these states actually feed what we are building. Where does this paradox lead you? Life likes to throw us paradox, or at least the unexpected. On some days, I find this amusing and even wonderful. On other days, frustration, disappointment, self-judgment, and blame are the result of things not turning out the way I expected. The heavens are a mirror for this paradox, just as our communities are too. Point yourself in any direction (this is a metaphor for intention) and behind you in the opposite part of the sky is another equally valid point of view. Opposing signs in the zodiac mirror this quality of life. Point in any direction in your community—this can look like a shared intention or value—and lo and behold, the opposite thing arises. How do we navigate these tensions or pulses in our communities and in our selves? The Moon is waning through the last week of this lunar cycle dedicated to the Aquarian theme of community. * This last part of the cycle is about evaluating and letting go of attachment. That, in and of itself, is a paradox. The process of evaluation means we care about improvement, about doing it better next time, and that our actions make a difference to outcome. The process of letting go means we surrender to the fact that we can never really know nor recreate the impact our actions and intentions have had. We try our best and move on. At the end, we release so a new cycle can begin. Perhaps the best way to navigate through paradox is to develop attunement to cycles. I certainly believe this is one of the major gifts that astrology offers. The stars do not compel us to act in any particular way; yet when we align with their cycles, the way becomes easier, we develop the muscles that help us swim through the currents of paradox rather than be swept away by them. Sometimes when things don’t turn out the way we plan, something even more wonderful happens. This week, Venus, a retrograding Mercury, and even Pluto and Saturn are orchestrating a week that could hold a lot of the unexpected mixed in with a dose of wonder. Certainly paradox will also be present. Are you willing to take the plunge? Forecast March 3, 2013 – March 9. Sunday, March 3. The morning may be a good time to process deep emotions with someone close to you. A somewhat slow, internally focused day turns more energetic towards the afternoon/evening when the Moon enters Sagittarius. Flights of imagination may take us on mind-expanding journeys. 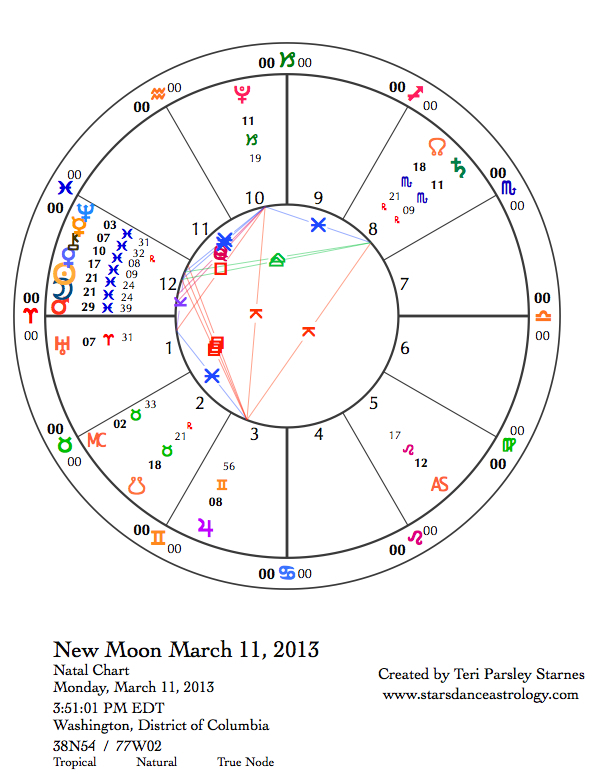 March 4—Last Quarter Moon: Evaluating. How idealistic are you that communities have the power to change the world for the better? That question may be part of the evaluation of this lunar cycle. Does involvement in community seem like more trouble than it is worth? Or is there something inherent to the experience of community that helps us do the changing we need to do? Perhaps community is the petri dish of evolution. Perhaps we really do need each other. And perhaps you realize how important community is and have still been disappointed by it. All that is fodder for new understanding. Mutable energy stimulates our desire to learn and understand, and that energy is strong now. With so many planets in mutable signs today, we may be over-stimulated but there is also the potential to be surprised with new information. Mercury reaches the heart of its retrograde journey today as it comes into an inferior conjunction with the Sun at 14 degrees Pisces. The Sun stands for consciousness, ego, and our ordered understanding of the way things are. Mercury can help us achieve better understanding of these parts of ourselves but also may work as the Trickster, providing the paradox that forces us to change our point of view. Be open to unexpected insights. Venus in Pisces is square to Jupiter in Gemini. With the Moon in Sagittarius, a configuration called a t-square is formed, which adds even more to the story of needing to see from a different perspective. Mutable signs are about perception too. Oceanic feelings meet instinctive action, meet abstract intellect—at the very least we will have interesting encounters with other people today. And at the most, we integrate new understanding about something that has been troubling us. If more confusion arises in your communications with others, give it time to resolve after Mercury turns direct on March 17. Tuesday, March 5. A little bit of tension starts the day. The last aspect the Moon makes before turning void-of-course until the early evening is a square to Mars. Conflict may have us wanting to run away. With conscious choice, what do you really want to do? Venus conjunct Chiron today opens up our hearts. This may be uncomfortable too, but the lessons may be very important. Can you stay open? Wednesday, March 6. Feelings are bubbling up all over—all sorts of feelings. What do you do with them? The Moon in Capricorn encourages us to find useful form for these feelings. As the Moon contacts both Uranus and Pluto today, the form we may want to create could be to make change happen in profound and even revolutionary ways. Mercury—the god of thought and communication—and Venus—the goddess of love and beauty—join together in Pisces. Both of these planets are too near the Sun’s glare to be visible. An interesting thing to contemplate is that from the Earth’s perspective, Mercury is in front of the Sun and Venus is on the other side of the Sun. However, they are still conjunct because they are at the same degree of the zodiac. I love the image of Venus and Mercury making a Sun sandwich. As these planets and the Sun align, we invite big transmissions of understanding and heart opening. Another big boost to this alignment is Venus, Mercury, and the Sun in a supportive exchange with Saturn in Scorpio and Pluto in Capricorn. Today and tomorrow, things come together in strong and powerful ways. Thursday, March 7. It is common for folks to complain about Mercury retrograde. Some hate the disruption to the way things regularly proceed. Others hate that everyone is always blaming Mercury retrograde for when things don’t turn out the way they planned. The haters may not have reason to hate today. Even though Mercury is still moving retrograde (from the perspective of Earth), the alignment that Mercury makes to Saturn and Pluto today makes it all better. Expect things to go pretty well if you are willing to take responsibility for the outcome. With that said, the paradox I mentioned in the introduction to this week’s forecast may be presenting itself to us in a big way. This past Winter, a Yod aspect configuration formed between Saturn, Pluto, and Jupiter. Yods stretch our perceptions; we have to account for paradoxical experiences. This same pattern is present again from now until the first week of April. Jupiter in Gemini challenges us to surrender dogmatic truth. If we let go of cherished beliefs, we might find a deep source of transformative power. March 8—Balsamic Moon: Surrendering. The Moon returns to Aquarius at the end of this lunar cycle. What have we learned about community? The ways we are connected are more mysterious and vast than any human can possibly understand. I invite you to release trying to manage your communities and trust the process. Mercury contacts Chiron today. Chiron often provokes an experience of initiation. Are you being initiated into communal awareness? Saturday, March 9. The dark of the Moon, before a new cycle begins can be a great time to vision about your next soul journey. It is coming soon. The Moon in Aquarius encourages visioning. Mercury and Jupiter form a square to each other, and because they are in each other’s home signs, we say they are in mutual reception. This strengthens the exchange and collaboration between these two planets. Express what you are feeling in your heart. Someone else may need to hear that message.